SpaRedi is an aroma therapeutic variety of spa products created with the client's needs in mind. This product line contains essential oils and herbs that nourish the skin as well as the senses. The natura of the products is to provide healing plus relaxation sensations while the oils and fragrances penetrate and hydrate the skin. 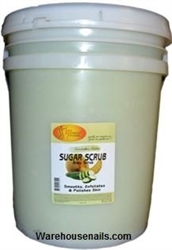 SpaRedi Sugar Scrub is an essential step in the treatment of rough, dry skin. The application of the sugar scrub smoothes calluses on the hells and eliminates build up of dead skin. The natural oils moisturize the feet while regenerating the skin back to a healthy state.